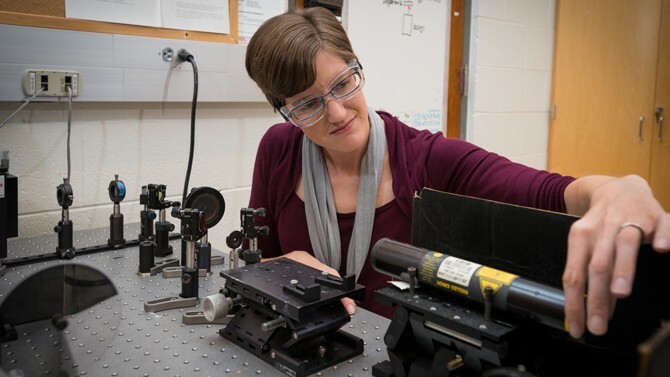 Stephanie Law, Clare Boothe Luce Assistant Professor in materials science and engineering at the University of Delaware, has received a Department of Energy Early Career Award to study optical excitations in topological insulators. She will receive $750,000 in funding over five years. Topological insulators are materials that conduct electricity only on their outer surfaces. That’s different from common conductive materials, such as copper wires, which carry current both inside and out. “The electrons on the surface of topological insulators are very special,” Law said. They have tiny masses — even for electrons — and move at “an appreciable fraction of the speed of light.” When these electrons are exposed to light, they spin and vibrate in unusual ways. As a result, topological insulators are sensitive to light in the terahertz range, which falls between microwave and infrared radiation. Terahertz light is invisible to the human eye and penetrates some opaque materials. Eventually, topological materials and the terahertz light they respond to might be used for defense applications, such as detecting explosives or examining the contents of shipping containers, says Law. For now, Law and her team are exploring exactly how topological insulators interact with light. “It’s important for the DOE to fund this kind of basic materials research, or we’ll never have new devices,” she said. For her investigations, Law makes thin films with stripes of bismuth selenide, a topological insulator. The films are made using a technique called molecular beam epitaxy, which allows material to be deposited one atomic layer at a time. Then Law studies how the electrons on the surfaces of the stripes vibrate in response to light. The electrons behave differently depending on the thickness of the film or the width of the bismuth selenide stripes. Law will also make multi-layered films to see how electrons on one stripe interact with those on another. Law is making waves in an emerging field. Topological insulators have only been around for about a dozen years. “It’s validating that the broader community is interested in my research ideas and willing to bet that I will produce results,” she said. The Clare Boothe Luce Program, which began giving grants in 1989, is now the single most significant source of private support for women in science, mathematics and engineering. The widow of Henry R. Luce, Clare Boothe Luce was a playwright, journalist, ambassador and member of Congress. In her bequest establishing this program, she sought “to encourage women to enter, study, graduate, and teach” in science, mathematics and engineering.